We’d love your help. Let us know what’s wrong with this preview of How Could This Happen by Dan McMillan. In How Could Thi The Holocaust has long seemed incomprehensible, a monumental crime that beggars our powers of description and explanation. Historians have probed the many sources of this tragedy, but no account has united the various causes into an overarching synthesis that answers the vital question: How was such a nightmare possible in the heart of western civilization? In How Could This Happen, historian Dan McMillan distills the vast body of Holocaust research into a cogent explanation and comprehensive analysis of the genocide’s many causes, revealing how a once-progressive society like Germany could have carried out this crime. The Holocaust, he explains, was caused not by one but by a combination of factors—from Germany’s failure to become a democracy until 1918, to the widespread acceptance of anti-Semitism and scientific racism, to the effects of World War I, which intensified political divisions within the country and drastically lowered the value of human life in the minds of an entire generation. Masterfully synthesizing the myriad causes that led Germany to disaster, McMillan shows why thousands of Germans carried out the genocide while millions watched, with cold indifference, as it enveloped their homeland. Persuasive and compelling, How Could This Happen explains how a perfect storm of bleak circumstances, malevolent ideas, and damaged personalities unleashed history’s most terrifying atrocity. To ask other readers questions about How Could This Happen, please sign up. This is a very short book (213 page) on an immense topic....the Holocaust. which frightens people like no other event in history. The particular horror of it was the way the Nazis denied the worth of human life and their credo that Jews were vermin that needed exterminated from the earth. The author attempts, to dissect the reasons why the population of Germany could be capable of such boundless inhumanity. He posits that it was the perfect storm...a broken people after the humiliation of their This is a very short book (213 page) on an immense topic....the Holocaust. which frightens people like no other event in history. The particular horror of it was the way the Nazis denied the worth of human life and their credo that Jews were vermin that needed exterminated from the earth. The author attempts, to dissect the reasons why the population of Germany could be capable of such boundless inhumanity. He posits that it was the perfect storm...a broken people after the humiliation of their loss in WWI which was never accepted in Germany, destructive ideas. and the bleakest of circumstances to produce history's most horrible catastrophe. He explains how Hitler came to power and was seen as a savior after the fall of the Weimar Republic; the anti-Semitism that was already present in Germany; the fear of Communism which Hitler thought was controlled by Jews; the rising belief of eugenics which placed the Jews at the bottom of human kind; the cheapening of life brought on by the slaughter of the Great War, just to name a few. McMillan is very logical, laying out the reasons the Holocaust came about and why, without these special circumstances all working together, it can never happen again. These circumstances include many we've heard before: the punishing aspects of the Treaty of Versaille, a long history of German anti-semitism, the brutality of WWI had desensitized people to suffering and murder. But there are chapters on how the lack of experience with democracy led the German elites to favor dictators. McMillan believes that the Holocaust is different from other recent genocides because the others had a political reason behind them. The perpetrators didn't stop victims from leaving; they encouraged it. They were only interested in victims within the their own borders; they didn't round them up in other countries. In other genocides they wanted to be rid of the other group but they didn't want to exterminate the group. A very thoughtful and insightful book on an extremely difficult topic. The Holocaust is a difficult historical event about which to read but we really ought to do so to gain an understanding and be on the lookout to prevent it from happening again. At least that is my view of this monumental crime against humanity. This is interesting because it is an attempt to dig into the events and explain how they could take place in an ostensibly advanced 20th Century society. I think that McMillan succeeds pretty well in his aims and it is refreshing to see so many strands co The Holocaust is a difficult historical event about which to read but we really ought to do so to gain an understanding and be on the lookout to prevent it from happening again. At least that is my view of this monumental crime against humanity. This is interesting because it is an attempt to dig into the events and explain how they could take place in an ostensibly advanced 20th Century society. I think that McMillan succeeds pretty well in his aims and it is refreshing to see so many strands come together and his steadfast refusal to simply throw up his hands and attribute it to generic evil or worse, events that are simply too enormous to contemplate. We do everyone who perished a disservice to simply give up on the explanations. So this book attempts to draw the strands of history, WW1, the political rise of antisemitism, Hitler and the Nazis together and it works for me. I understand it better but I would like to return to this book next year and go over it again so that the messages really go in. There just isn’t an answer... and I think that’s part of what makes it such an intriguing subject to learn about. It just boggles the mind. It’s scary to think that something like this is possible – still possible; call me a cynic but I don’t think humanity is immune from a repeat. Paraphrasing myself from another book review: Institutionalized racism is insidious. What starts off as a guideline (often times misguided) for the alleged benefit of the community can quickly devolve into an us versu There just isn’t an answer... and I think that’s part of what makes it such an intriguing subject to learn about. It just boggles the mind. It’s scary to think that something like this is possible – still possible; call me a cynic but I don’t think humanity is immune from a repeat. Paraphrasing myself from another book review: Institutionalized racism is insidious. What starts off as a guideline (often times misguided) for the alleged benefit of the community can quickly devolve into an us versus them mentally, pitting people against each other and stirring up violence and hatred and intolerance. It scares me how people don’t see a slippery slope when it’s staring them in the face. Charter of Values in Quebec anyone? This book presents a lot of interesting ideas of how culture and history mixed over the years to create the right conditions for the Holocaust, and it does puts forward some very plausible causes, but in the end I think it’s the ultimate unanswerable question. Nicely researched and succinctly written. Adequately illustrates how events that happened before (going back to how Germany was created) Hitler's rise to power attributed to the Holocaust. This is one of those books that everybody should read! However, I would have enjoyed more of an explanation/statistics (since it sounded too much like conjecture) after the author makes the assertion on pg. 88 that, "before 1918 only the much-maligned socialist party had demanded that the country become a democr Nicely researched and succinctly written. Adequately illustrates how events that happened before (going back to how Germany was created) Hitler's rise to power attributed to the Holocaust. A one of a kind book, that is truly important and leaves a mark. The book is incredibly well researched and written. The topic can lead to either very dry or difficult to read texts, but this one flows with simple beauty and truth. Each chapter takes the reader through a different topic to explain the Holocaust, ranging from a historical overview of German politics, Hitler's history, social background of the time, economic climate, the pulse of other European countries and anti-Semitism in various A one of a kind book, that is truly important and leaves a mark. Each chapter takes the reader through a different topic to explain the Holocaust, ranging from a historical overview of German politics, Hitler's history, social background of the time, economic climate, the pulse of other European countries and anti-Semitism in various forms. I am grateful to the author for writing this book. It stands alone, no other book I've read can touch it. A fairly academic and fairly dry assessment of the social and economic factors behind the holocaust. The author claims that he is discussing points that previous authors have not in other books about the holocaust, but I found his arguments pretty run-of-the-mill. Still, not a bad book by any means. There was a lot of emphasis in explaining how the holocaust was unique compared to other genocides, which I found interesting. Great summary of the history and other background relevant to the Holocaust. Falls a bit short of its goal of being the first general work to explain the reasons. I don't buy the author's claim that there's a consensus among historians as to the reasons and the only need is a good general wok on the topic. But this book is a great start in that direction and a great addition to the discussion. A quick read and well worth the time. In school, we were taught that WW2 happened because the Germans were humiliated after WW1 and the Treaty of Versailles. This book delves farther back (before WW1) and pinpoints Germany's late conversion to democracy (i.e., later than England and France) that led up to WW2. Historical examination of the causes of the Holocaust, perhaps of great relevance in 2016 America where muslims and Mexicans are being scapegoated by political demagogues. good for overarching ideas but left some questions. On BookTV, Dr. Dan McMillan presented his well-researched book on "How Could This Happen." Here is a book review: (http://www.drdanmcmillan.com). Fascinating, and really puts the events leading to the Third Reich and it's terrible consequences in a scarily realistic light. It happened once, therefore it can happen again. Review by Carl J. Rheins for the Jewish Book Council. Very informative book. 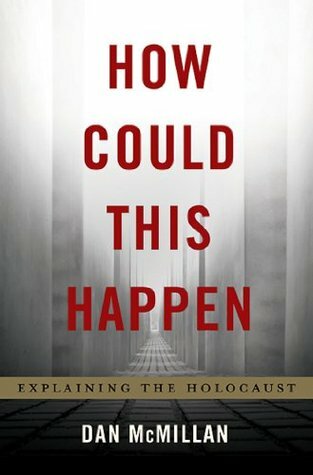 A must read for anyone who wants to know why the holocaust happened.